Welcome to my stop on The Adventures of Hashbrown Winters blog tour! For a chance to win a paperback copy, please fill in the Rafflecopter form at the end of this post. The Adventures of Hashbrown Winters is the first in a fun chapter book/middle grade series by Utah author Frank L. Cole who is also the author of The Guardians of the Hidden Scepter and The Guardians of Elijah's Fire. The Hashbrown Winters series also includes Hashbrown Winters and the Moshimoto Madness, Hashbrown Winters and the Phantom of Pordunce, and the soon to be released Hashbrown Winters and the Whiz-Tastrophe (April 9, 2013). The cover artwork and chapter heading illustrations for Hashbrown are by Utah artist Adam Record who is also the illustrator for the Recordable Storybook Rudolf the Red-nosed Reindeer from Hallmark (2012) and The Ugly Duckling from Oxford University Press. Meet Hashbrown Winters. Like any typical Pordunce Elementary fifth grader, he's got a story. Actually he has several. There's the story of how he got his nickname, the story of how his treehouse club became one of the most popular groups at school, and, of course, the story of his untimely demise after a mishap with the beloved pet cockroach of Pordunce's walking death dealer, Hambone Oxcart. Will Hashbrown be able to convince Pordunce's own mob boss, Cordovo Figanewty, to offer him protection? Or are his days at Pordunce about to come to a swift and painful end? In this hilarious debut novel from Frank L. Cole, every kid who's any kid has a nickname, and half the fun of the story is figuring out how they got it. 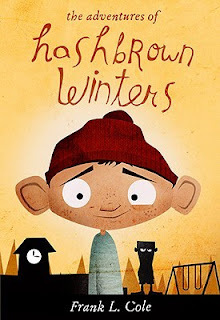 The Adventures of Hashbrown Winters will keep kids and parents alike laughing out loud, groaning in sympathy, and turning pages until well past bedtime. Read the first chapter of The Advetures of Hashbrown Winters! This is a fun, quick read with a lot of character. Frank has created a cast of elementary school children that are such individuals, and at the same time accepted for who they are. That's one of the main draws of the book, the matter-of-fact way in which the characters interact with one another and the tone of the narration. There's one kid who pees his pants all the time, but his problem simply is what it is. He's got the nickname Whiz, but other than that he's accepted and even a part of Hashbrown's cool tree house club. He's one of the boys despite his problems. Same goes for Measles (has had measles several times and is extremely forgetful because of it) and Four Hips (very overweight and always produces random food items at strange times). People simply are who they are and it's a refreshing view to take both in and outside of the book. It's kind of an "we're all mad here" scenario. And really, isn't that true for real life? The fantastical elements spotted throughout the story are also viewed with the same matter-of-fact lens, such as a humongous pet cockroach and a talking locker (well there is someone inside...he's been in there for quite sometime), which all adds to the overall charm of the story. Frank has also written great dialogue that rolls easily and moves the story along at a good pace. The dialogue fits the characters and expands their personalities making the story very entertaining. The Adventures of Hashbrown Winters is a fun read aloud that will get lots chuckles. It's also a great story for the more reluctant reader types because of the easy to follow plot, the at times empathizable situations, and the fun cast of characters. Everybody has a nickname in the Hashbrown Winters series. The main character, Hashbrown, received his nickname after winning a near-death hashbrown eating contest. He's very proud of his nickname. Here's a recipe video for easy hashbrowns like the kind you can get at fast food restaurants. Mmmm. I love those kinds. Please fill in the form below to enter the giveaway. Open to US only, times are EST.